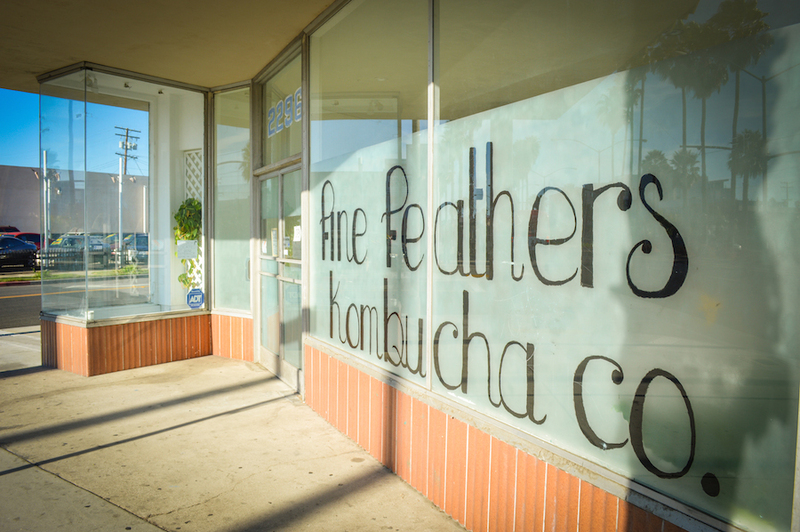 It is safe to say that almost two years ago, wife and husband team Jodine Penev West and Jay Penev introduced Long Beach to kombucha through their Fine Feathers brand. Rightfully so in a sense: between Jodine’s calm and zen-like composure and Jay’s unapologetic ecstasy about both kombucha and community, the pair exude a natural Long Beach-ness. Jay’s statement about creating community through his business fits the growing mold of young, Long Beach business owners looking to change the city in a positive way that goes beyond the wallet. Having moved here in 2011 from Portland, Jay hails from Bulgaria while Jodine was born and raised in Long Beach. After a trip to Mexico—“The sun was a catalyst,” Jay said—the pair moved to Long Beach with no clear intentions outside escaping the gloom of Portland. 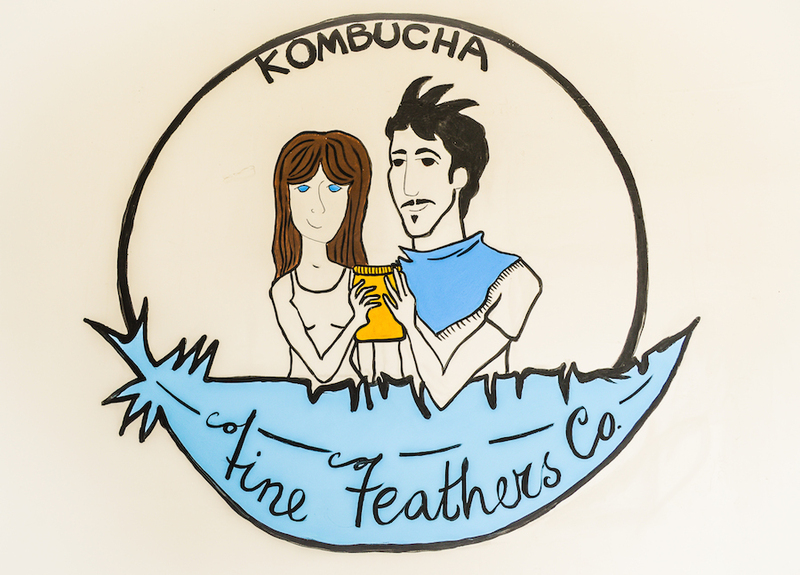 The pair, jumps from local coffeeshop to local restaurant to sell their product, operating out of a commercial kitchen and gaining success for their high-quality, craft kombucha that puts almost any larger brand to shame. Though they were excited to expand their operations, they weren’t expecting to open a straight-up brick-and-mortar storefront—which is precisely what they ended up doing. Located at the corner of Long Beach Blvd. and 23rd St., Fine Feathers originally looked at Signal Hill to simply open a production facility before being led to their new space. After cleaning up the former flower shop with new paint and doing the floors themselves—an endeavor Jay suggests no one take on on their own—Fine Feathers is open for business in Central Long Beach. Their operation, according to Jay, is a green operation: with sinks that collect their waste (which is then used as compost and donated to Foodscape) and no energy used to brew the concoction—“except for when customers are here and we have the lights on,” Jay noted—Fine Feathers is the epitome of what it means to create an environmentally-conscious product. This even extends to how you get to their store; ride your bike and you’ll get a hefty 20% discount on your fermented goodness. 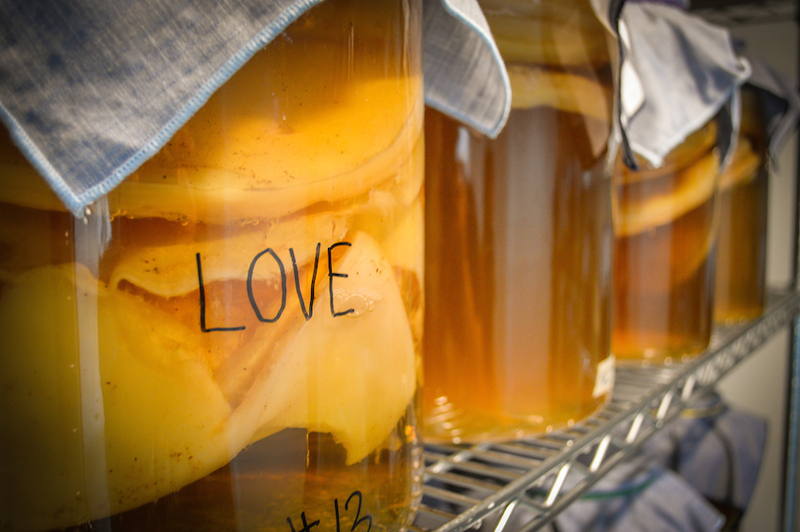 Jodine echoes her husband’s sentiment when she succinctly notes that they only give back what the community has given them—and if you’ve never had their kombucha, prepared to be spoiled. I myself sit disappointed with practically every bottle I get from any other brand; it just pales in comparison to Fine Feathers’ guava or lemon-cayenne concoctions. Even better, there’s now a serenely bright and light space for you to go chill and drink your kombucha, as well as have enlightening conversation with the multi-lingual Jay, who is open to conversations ranging from music (he plays in the locally-famous outfit Fathers & Suns) to biking (he rides with Long Beach’s own Gfunk). Fine Feathers is located at 2296 Long Beach Blvd. and is opened Wednesday through Saturday from 12PM to 7PM; Sunday from 11AM to 3PM; and closed on Monday. If you wish to come in on Tuesday, you can do so by appointment only for pickup.